Tags: Isaac Haxton, Jason Koon, MysterioBrown, partypoker, powerfest. Posted on Friday, September 21, 2018 by "T". It was indeed an intense showdown, but in the end it was player "MysterioBrown" who stopped team partypoker tandem Isaac "Ike_Haxton" Haxton and Jason "Jason_Koon" Koon in their tracks and claimed the number 1 spot in the POWERFEST Event #112 Super High Roller: $10,300 Pot Limit Omaha Six-Max Championship Event. A total of 97 players entered the high-stakes event, with a prize pool of $970,000 thereby surpassing the $500,000 guarantee. Swedish online MTT crusher Niklas "Drulitooo" Astedt also had done pretty well for himself in this event, ending up in 4th place with a nice $84,875 payday. Meanwhile, Jason Koon and Ike Haxton settled for 2nd and 3rd place respectively, earning a 6-figure sum for their efforts. As for MysterioBrown, he/she won the highest 6-figure first prize for this event worth $303,421 and is also enjoying a nice custom trophy. 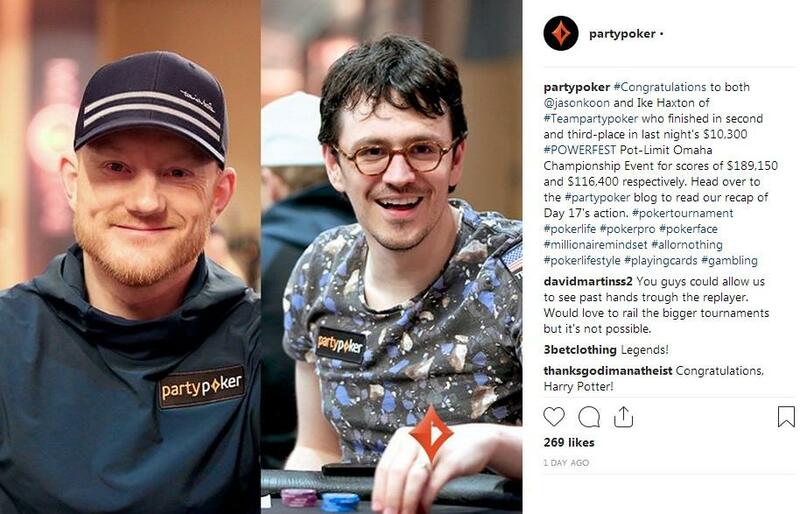 8 comments for "partypoker teammates Koon and Haxton denied PLO SHR Victory"
The title for this news article is kinda confusing. What exactly do they mean with the denied? I have read the whole post but couldnt figure it out. Anyway both second and third places paid good. I doubt they had a problem with that. For two professional players like Jason Koon and Isaac Haxton does not matter too much occupied position. They are team of Party Poker and they are able to win a lot of money from poker in any room. The winning player was ,,mysterious'' and has cashed 300 k dollars. The difference is too high, this is true, but this is it. I know, the sums at the final table in all big tournaments should be changed. I think 7-8%t for the winner is very good. They meant that they could not reach it since the fellah who finished first sent them home. It just a weird/archaic use of the phrase. it is more interesting and fun for me also. I prefer mostly the Hi/Lo. These two games are the ones that i have been profitable, while i was grinding. With holdem it was nothing more than a loss, while playing ring games. So i ended up very fast excluding holdem from ring games, playing only a few tournaments. Congratulations to MysterioBrown, for his great victory is this PowerSeries event and in addition to the great prize he won with his teammate, to follow the successes.